I have been investigating an account of a landing/entity encounter case at Coogee, a seaside Sydney suburb. According to the information so far available, the alleged incident occurred at about 4 am on February 29th this year. A man walking down a street, observed a flash of light. 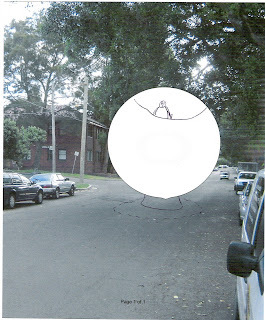 In that direction he saw a large spherical shaped object sitting on the street T intersection. He could see a little man in a window at the top of object. The witness became frightened, retreating behind a large electrical signal box. The being appeared to move a lever, a “shutter” came down over the window area, and the object took off at tremendous speed at about a 45 degree angle. The bitumen road surface appeared to have a white circle effect left behind and at least one nearby tree appeared to have been burnt. The witness reported noticing heat coming from the object. The duration of the incident was about 5 minutes. The road surface was repaired soon after by local council road maintenance crew as the road is a very busy route mainly during the day. I met the witness on March 19th. I first visited the site on the night of March 19th and have revisited the area on a number of occasions since then. I have samples of the burnt tree bark. I was also advised that soon after the incident a new electricity telegraph pole was placed at the intersection and repair work was undertaken on the electrical wiring connections. Further investigations will be undertaken to see if these matters are related to the February 29th event. The witness is a shy man of nervous disposition and seems unlikely to be the type that would make up a story of a UFO incident, and does not appear to have much knowledge of the UFO subject. I was very struck by the similarity of the Coogee witness’s description and drawings to two overseas cases – Cussac, France (August 29, 1967) and Goffstown, New Hampshire, USA (November 2, 1973). The Goffstown NH 1973 encounter also occurred around 4 a.m. The Cussac France 1967 encounter – the beings “floated” into the top of theUFO. The photo in this post was taken by me on location in Coogee. I have superimposed a rough drawing of the object. 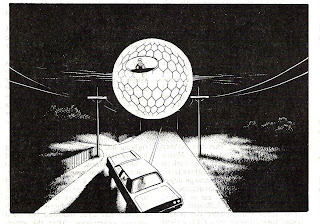 The drawing of the Goffstown incident with the UFO hovering over the car was done by Brian James. See the APRO Bulletin January February 1974, pg. 6.